As a highly experienced family law attorney, Mr. Darren M. Shapiro Esq. has frequently been faced with the various complex issues surrounding child custody, parenting rights, and visitation time. When a child is involved within any legal case, there are wide ranges of complicated and sensitive issues that must be considered, as the legal standard is to put forth a determination that is in the "best interests" of the child. Agreements can be made by the parties' themselves through one of the different processes that are out there such as negotiations, mediation, collaborative law or litigation. If a court needs to decide thee issues, making a determination that coincides with the "best interests of the child", means looking into the requests of that child's parents, the wishes of the child themselves, and the relationship the child has with each parent, siblings, and other individuals that may be present within a particular situation. One common set of circumstances that typically arises after an initial decision regarding child custody, parenting rights, and visitation - is the arrival of a new significant other within one of the parent's lives. Often, this event can lead biological parents to ask for parenting time or visitation rights and custody determinations to be reconsidered, in light of the new arrival. As uncomfortable as the concept may be to think about, the truth is that most people will find love again after breaking up with a previous partner. Though this romantic progression may not have a huge impact on people who don't have children to think about, it's clear that issues of discomfort and concern can arise when there are matters of children to consider. Often, Mr. Darren Shapiro can helps people sort through these new problems with his toolbox of different processes whether people choose mediation, collaborative law, negotiation, or litigation. Some clients throughout New York and Long Island may decide to file new applications - as the residential primary biological parent - to request that time with the non-residential parent should be limited now that they are seeing a new romantic interest. Sometimes, the concerns surrounding a child's ability to interact with one of their parent's new partners are legitimate, as it is often difficult to determine immediately whether a new person will have a positive or negative impact on the child's wellbeing. However, Mr. Shapiro has found that the reasons that prompt parents to request limited visitation time can be complicated and varied - ranging from basic jealousy, to serious worries over the safety of the child. In the same strain, it is not uncommon for clients to request Mr. Darren Shapiro's help in attaining a change of custody, when the other parent gets involved with a new partner. The requested change may be from the parent that has a new partner. The truth is that new relationships - no matter how they may emerge - can change circumstances, regardless of whether the change is simply emotional, or more tangible. In some cases, the change may be positive, whereas in others it could be negative, or a combination of both. Mr. Shapiro has found that issues in relation to custody and visitation times may arise for a variety of different reasons. Firstly, for example, ex partners may decide to raise concerns regarding rights for visitation simply because they feel uncomfortable with the idea of another person being romantically involved with their ex-partner. Perhaps more substantially, the parent may also worry that too much exposure to a new parental figure could cause them to be replaced within the child's affections. Often, if these highly emotional reasons form the basis for a request to change a custody order, or visitation rights, the court will be unlikely to take them seriously. As always, it will be the best interests of the child that the court must consider in any legal situation. Sometimes, concerns that emerge regarding child visitation and parenting time come about because of the feelings that a child has towards one of their parents' new partner. If the evidence available suggests that it may be outside of the best interests of the child to be exposed regularly to a parent's new partner, then there may be a case to request changes in visitation or parenting rights. 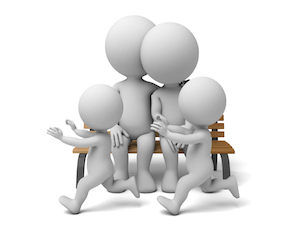 In some situations, the child in question simply may not want to spend time with the new partner, and anyone that the partner may bring into the equation - such as children from previous relationships. Sometimes the children want to spend more time because they enjoy the new dynamic. In these cases, the court may take the feelings of the child involved into account when making a decision - so long as the child is mature enough to make a sensible decision regarding their lifestyle, and future. Importantly, if the court discovers that a child was encouraged by one parent to suggest they want less time with the other parent's new partner, this will be severely frowned upon. Mr. Darren M. Shapiro encourages people who feel as though they are facing issues in spending time with their child, or children to access professional legal help. Accessing a trained lawyer or if the couple is willing to go to a mediator can be crucial. Applications can be made to a New York family or Supreme Court with a request to enforce an agreed-upon parting schedule or visitation order - or to have one made for the first time. For a parent to achieve their desired outcomes, there are numerous processes that can be considered in reaching their desired goal. For instance, collaborative law, or mediation can be used, but it's important to recognize that both parties must be willing to engage in these processes and make such a process work. In the event that this is not possible, Mr. Shapiro may help a client to move through the more traditional routes of settlement negotiation and litigation. Though issues regarding children are complex and emotional, Mr. Shapiro frequently reminds his clients that modifications regarding child custody and visitation awards often require a change in circumstances deemed to be significant. Often, the presence of a new partner within the other parents' life isn't enough to prompt a modification in previous orders. However, if the new person in the ex-partner's life may have a positive or negative impact on the best interests of the child, then issues regarding all manner of child custody and visitation will need to be considered. To learn more about the details of child custody, visitation, and parenting rights, please reach out to us. If you are interested in accessing the professional help of Mr. Darren Shapiro as a family lawyer, litigator, or mediator, then please schedule your free first half-hour consultation appointment at your earliest convenience - either in office, or over the phone. We look forward to speaking with you about your needs.